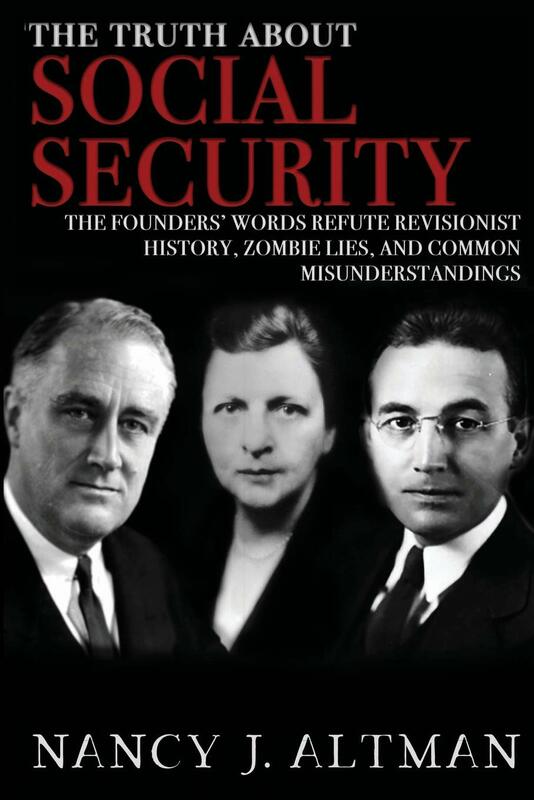 In, "The Truth about Social Security: The Founders' Words Refute Revisionist History, Zombie Lies, and Common Misunderstandings", Nancy Altman uses Social Security founders' own words to debunk myths and reveal the truth about the most popular and successful government program in our nation's history. According to Kirkus Reviews, "Altman's approach is uniquely historical she looks at the speeches and writings of those who originally designed the program, like Roosevelt, and those who subsequently defended it, like Eisenhower. She also discusses Social Security as a consummation of fundamental American ideals like individualism and self-sufficiency,.... [S]he highlights the ways it has been one of the most potent legislative antidotes to poverty ever devised." Altman has a 40-year background in the areas of Social Security and private pensions. She is co-director of Social Security Works and co-chair of the Strengthen Social Security coalition. She is the author of The Battle for Social Security: From FDR’s Vision to Bush’s Gamble (John Wiley & Sons, 2005), and co-author of Social Security Works! Why Social Security Isn’t Going Broke and How Expanding It Will Help Us All (The New Press, 2015). From 1983 to 1989, Ms. Altman was on the faculty of Harvard University's Kennedy School of Government and taught courses on private pensions and Social Security at the Harvard Law School. In 1982, she was Alan Greenspan's assistant in his position as chairman of the bipartisan commission that developed the 1983 Social Security amendments. From 1977 to 1981, she was a legislative assistant to Senator John C. Danforth (R-Mo,), and advised the Senator with respect to Social Security issues. From 1974 to 1977, she was a tax lawyer with Covington & Burling, where she handled a variety of private pension matters. Ms. Altman is the Chairman of the Board of Directors of the Pension Rights Center, a nonprofit organization dedicated to the protection of beneficiary rights. She is also on the Board of Directors of the National Academy of Social Insurance, a membership organization of over 900 of the nation's leading experts on social insurance. In the mid-1980’s, she was on the organizing committee and the first board of directors of the National Academy of Social Insurance.